Nestled at 7400’ on the shoulder of Mount Heyburn in the Sawtooth Mountains, Bench Hut is a spectacular destination for downhill shredders and intermediate skiers. The trail to the hut proceeds gently up a ridge from the Redfish Lake trailhead (or 4 miles up from Fishhook Yurt) through 1,200' gradual elevation gain over 5 miles. Outstanding views of the Sawtooth and White Cloud Mountains mark this trail. Once at the hut, there are a variety of downhill skiing and snowboarding opportunities. You can ski the gentle powder slopes directly behind the hut or venture into the big alpine bowls, chutes and faces that encircle the lakes basin above Bench Hut. Ski and snowshoe tourers will love the classic 5 lakes tour which winds its way above Bench through frozen lakes surrounded by Sawtooth spires. Bench is a unique wall tent built onsite from local lodge-pole pine with a massive picture window that frames the spires of Mount Heyburn towering above. All the basic amenities are provided at the hut including two wood stoves, a three burner propane stove for cooking, pots, pans, tableware, a solar-power system for lights and charging widgets, bunks with comfy foam mattresses, books, cards, games and a wood fired SAUNA! Guests need only bring food, personal equipment and sleeping bags. 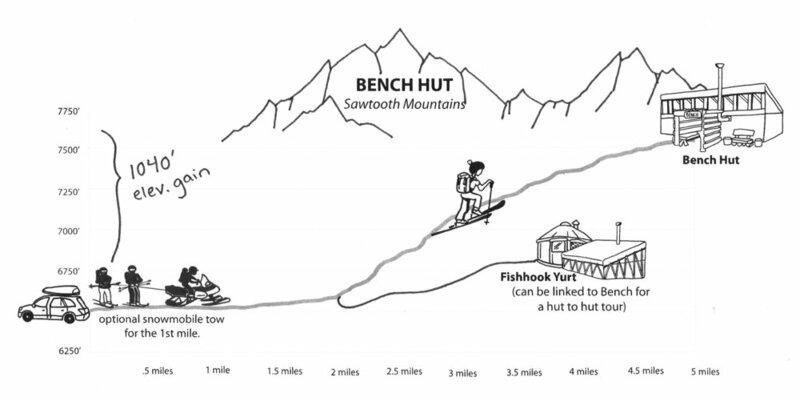 Bench Hut may be linked with the Fishhook Yurt or Williams Peak Yurt to make a Sawtooth Hut to Hut ski adventure. The minimum rate of $400/night applies for up to eight guests, $50 for each additional person. Additional kids from six to twelve are $25/night. It is required that at least one member of your group be familiar with the route, access and correct hut operations. 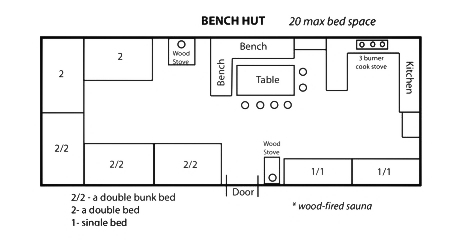 If this is your first visit to the Bench Hut, we require a Hut Rental Guide ($250) to accompany your party on Day One. The guide will lead your group to the hut and orient you to the facilities and how they function before leaving you to pursue your own personal skiing for the remainder of your stay. Sun Valley Mountain Huts provides porter ($200), snowmobile/cargo tow ($300-$400) and Hut Rent Guide services to make your life easier. Please visit the Services page for additional details. Would you like a ski guide for the duration of your trip? Learn about our partner, Sun Valley Guides here. We’d like you to have a phenomenal experience while staying at our huts! Good preparation before your trip will make the difference between an amazing adventure or an ‘epic’ one. If you choosing not to hire a professional guide you are entirely responsible for yourself and group. Please check out our web-page: How to Prepare for your Hut Trip to assist in the planning process. Additional resources you should use include : Avalanche Forecast: Bench Hut and Weather Forecast: Bench Hut. Please be sure that everyone in your group reviews the information and links found on this page. Each participant is required to fill out the online release form prior to departure. You can find useful additional resources on our Links Page including weather models, webcams and weather station links. Let us know if you have any questions and have a great trip!